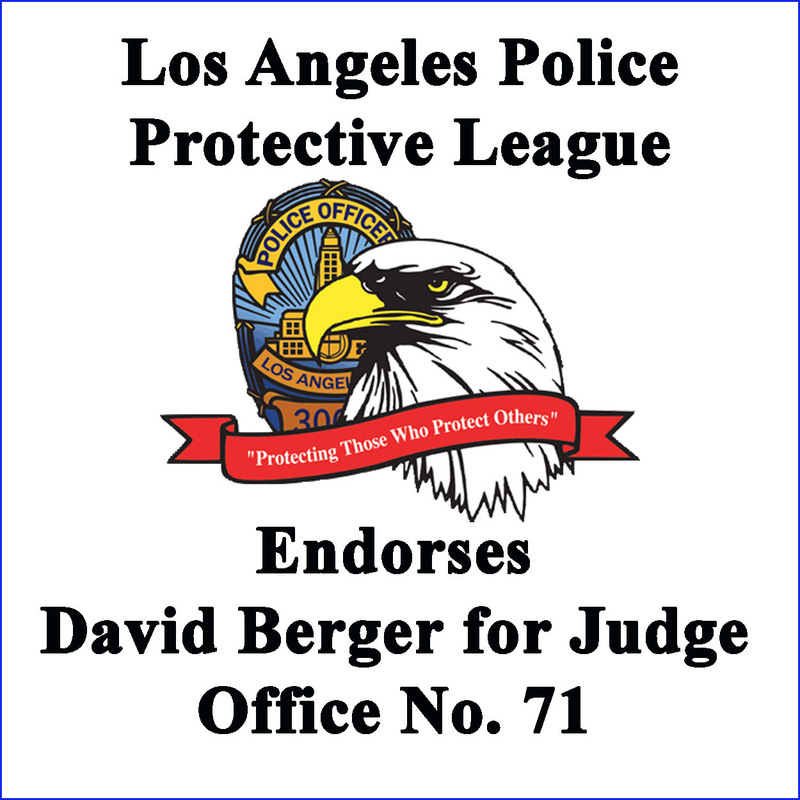 I am truly honored and deeply appreciative of receiving the exclusive endorsement of the Los Angeles Police Protective League in support of my campaign for Judge of the Superior Court, Office No. 71. The Los Angeles Police Protective League (LAPPL) was formed in 1923 and today represents more than 9,900 dedicated and professional sworn members of the Los Angeles Police Department. 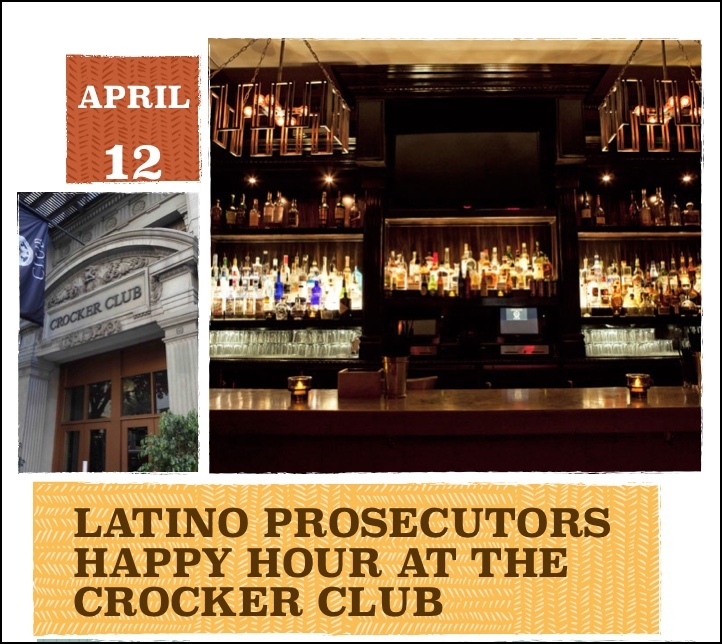 The LAPPL serves to advance the interests of LAPD officers through legislative and legal advocacy, political action and education. 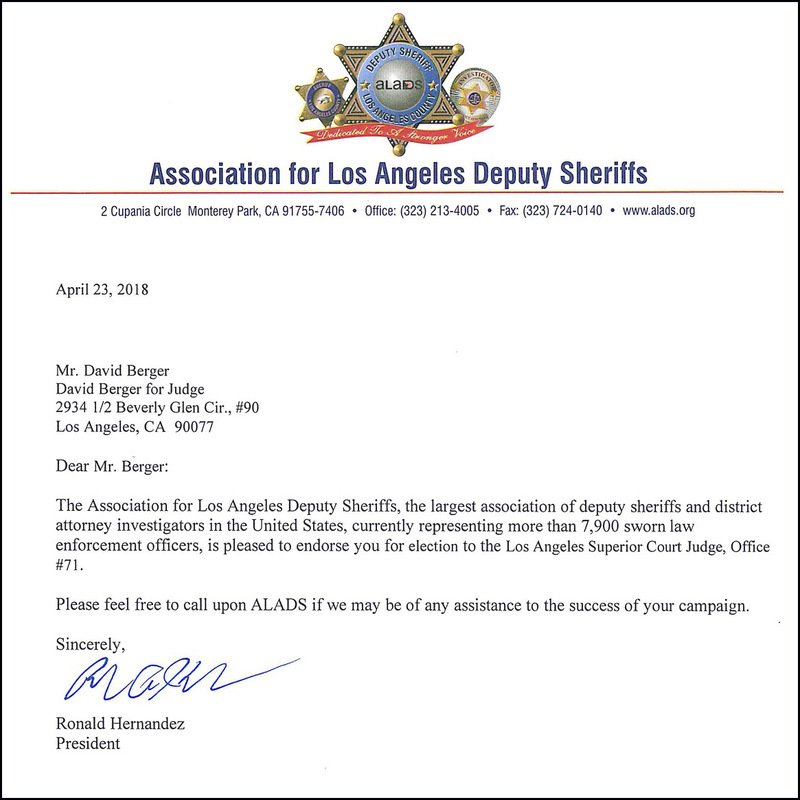 I am very proud and honored to announce that the Association for Los Angeles Deputy Sheriffs has endorsed me for Judge of the Superior Court, Office No. 71. 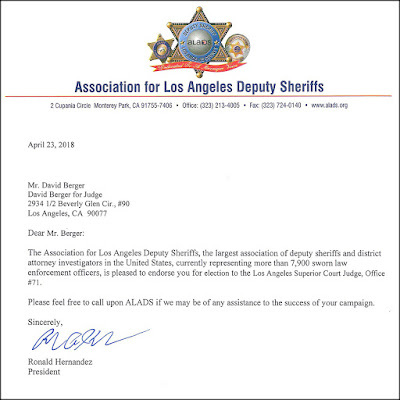 ALADS, the Association for Los Angeles Deputy Sheriffs, represents more than 7,900 sworn law enforcement officers, making it the largest association of deputy sheriffs and district attorney investigators in the United States. The Yard Signs are Coming! 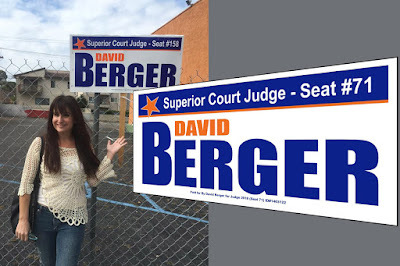 Yard signs. Love 'em or loathe 'em, no campaign is complete without them, and thanks to the generosity of my supporters, my campaign will have them in 2018 - just as we did in 2016. Nobody really knows how effective yards are in campaigns. Some say they do nothing at all. Others opine that they simply reassure existing supporters that they're backing a winner, while others suggest they increase name recognition. Who knows who is right? 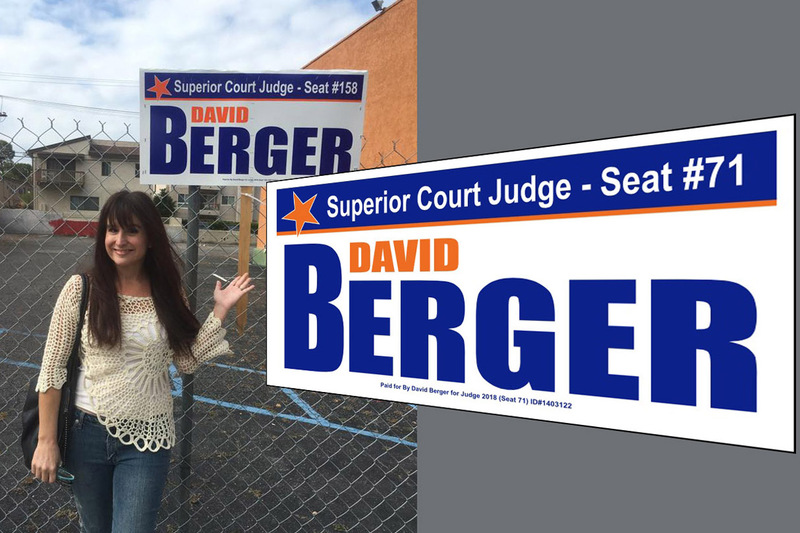 We have retained a trusted company to responsibly distribute our signs, and more importantly, remove them after the election so they don't create a trash problem. Love 'em or loathe 'em, the yard signs are back! 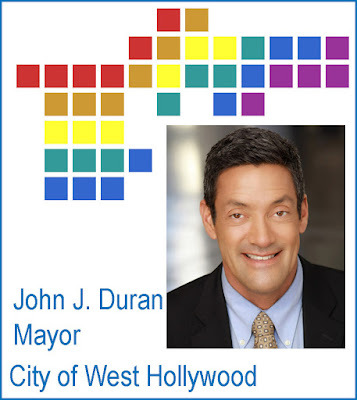 I am delighted to announce that John J. Duran, Esq., Mayor pro tempore of the City of West Hollywood, has endorsed my candidacy for Judge of the Superior Court, Office No. 71. I offer my deep thanks and sincere appreciation for Mayor Duran's endorsement. Good things happen when you least expect it. By sheer chance I met Judge Stephanie Sautner (ret) while she was sitting on assignment at the Airport Courthouse. We struck up a conversation and I was delighted to hear that not only was she aware of my candidacy, but she wholeheartedly endorsed it. Judge Sautner is something of a legend and trailblazer at the Airport Courthouse where she was the Presiding Judge before her retirement in 2013. 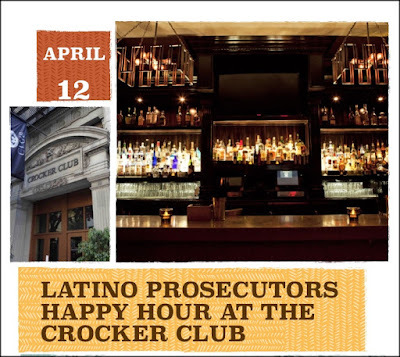 Judge Saunter was a NYPD Detective before ‘going west’ and studying law at Whittier College of Law. She passed the bar and her first job was working as a researcher for “People’s Court” a popular tv show where she worked with Harvey Levin, a Professor at Whittier. Yes, the Harvey Levin of TMZ fame. In 1984, she was hired as a Deputy City Attorney and headed the Slum Housing Taskforce where she attracted national media attention by requiring a Beverly Hills doctor to live in one of his slums. 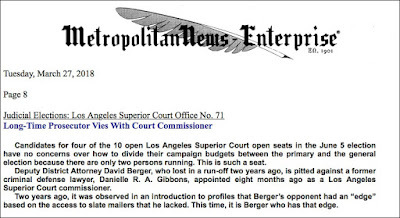 In 1992, she ran for election as judge, motivated in part by the fact that one of her opponents had opposed enforcement of slumlord probation conditions, and in part by then Governor Pete Wilson’s veto of anti-sexual orienation discrimination legislation. Judge Sautner’s election victory made her the county’s first openly lesbian judge. I value Judge Sautner’s endorsement highly and am immensely proud to have received it. To read more about Judge Sautner’s career, please CLICK HERE to read the article published by the Metropolitan News-Enterprise on her retirement. 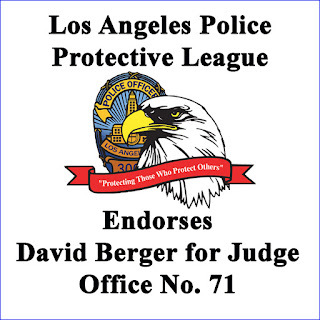 I am very proud and deeply honored to announce that the Latino Prosecutors Association endorsed David Berger for Judge of the Superior Court, Office No. 71 at their April 12, 2018 meeting. Many thanks to LPA President Richard Ceballos and all LPA members for their vote of support. Si Se Puede! The Los Angeles Metropolitan News-Enterprise published its profiles on the candidates for Office No. 71, one of 10 open seats on the ballot in the June 5, 2018 Primary Election.